Our solar system is pretty sparkling clean when it comes to dust. That isn't necessarily the case elsewhere, as many other stars are surrounded by thick disks of debris. These might actually be the perfect places to find Earth-like planets. That's the finding of astrophysicist Sean Raymond of France's Observatory of Bordeaux. He has run over 500 computer simulations looking at how the presence of large, dense debris disks - which we've already spotted around over a hundred stars - could serve as a predictor of Earth-like exoplanets. For debris disks to exist around old stars, you need a dynamically calm environment without strong gravitational perturbations. To form terrestrial planets, you need the same thing. So, it makes sense that these two outcomes should be correlated. I think the most important implication of the findings is that, if I am right, then debris disks can act as signposts for systems with a high probability of having terrestrial planets and, in some cases, Earth-like planets." "So, why don't we have this dust? Well, it turns out that for more than half a billion years after its formation, the solar system did have a bright debris disk! 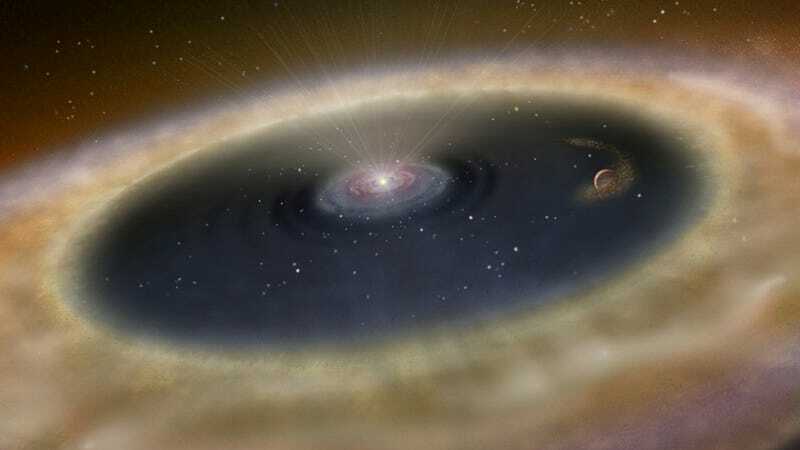 As is the case for other stars, the dust was produced by icy planetesimals occasionally colliding and grinding themselves away. This population of planetesimals was the primordial Kuiper Belt, and we think it contained about 50 Earth masses of material, at least 100 times more mass than it does today." This version of Kuiper Belt, however, was likely wiped away by Uranus and Neptune about 3.8 billion years ago as part of a period known as the Late Heavy Bombardment, giving us the relatively debris-free solar system we know today. Either way, if all those computer simulations are anything to go by, those debris disks are the place to be looking for Earth's twin. Raymond concludes there's "a high probability" of finding terrestrial planets inside any given solar system with a debris disk, and those that are free of gravity-wrecking gas giants have an even better chance. For more, check out Space.com. Image by Karen L. Teramura, UH IfA.